The chipmunk lives only in North America and Siberia. 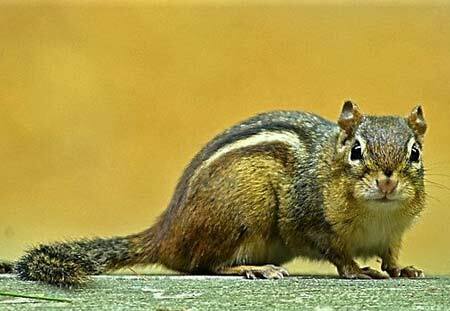 Like most squirrels, chipmunks produce 2 litters per year. They hibernate in their burrows over the winter. During the growing season they play an essential role in our ecosystem. They basically move seeds from the parent plant to new areas. They plant a lot of seeds during the process of storing their food. Since chipmunks are popular prey for many of our predators, they do not always return to the seeds they plant. Chipmunks can be a pretty big nuisance pest in the landscape. But they are an essential link in the food chain and they are relied heavily upon by the plant community for reproduction. The Eastern chipmunk burrows has most certainly made its presence known in the landscape. For instance, no one likes to see these rodents living under the porch. Furthermore, burrows along foundations are concerning too. In fact, they can cause significant structural damage. Under these situations, chipmunk control is necessary. More than anything two factors draw chipmunks onto your property; food and shelter. First, consider their food source. Obviously, bird feeders attract urban wildlife. Although chipmunks are omnivores, their preferred diet is seeds. Therefore if you want to control your chippies, then stop feeding the birdies. However if bird feeders are not around, consider tree fruit. Acorn nuts and even those winged maple seeds give them plenty of good eating. Make an attempt to remove these seeds as they fall. Leaf blowers make easy work out of this. Blow them into piles, and bag them up. Keep in mind that these rodents store this type of food. It makes perfect sense to take away their food reserves. Make them eat frogs and earthworms instead. Perhaps they will end up moving elsewhere. Second, look at your yard. Figure out where they are nesting. Most of the time they burrow under tree roots. One example is underneath surface roots of mature trees. They can even find old roots from previously removed trees. Alternatively, they burrow right down into the shrubbery around the house. There is not too much you can do about all of this. One thing you can try is filling their burrows in. After trapping, pack concrete into the burrow. Just remember that there is an emergency exit hole to fill too. Another option is ground screening. Stainless steel 1/4″ hardware fabric can be laid down, and then back filled. Similarly, Xcluder makes Geo blankets for professional use. When they get too close to the house, people take to chipmunk control. Chipmunks commonly take advantage of brick stoops, landscape rock, and patio steps. Certain homes have additions built on. Many of these have inaccessible crawlspaces underneath. This is a rodent safe haven. In this instance, you may find them burrowing underneath the foundation. Otherwise they jet into gaps underneath the siding. Not good either way. In order to get rid of chipmunks nesting under porches, you have to trap them. The best method is to seal potential entry points, while leaving the main entry open. After that is done, set traps directly over the entry point. That way you get whatever is in there, out. You can be sure that everything is out after 7 days of not catching anything. Remove the traps, and seal the remaining entry point. While you may feel that there are chipmunks living inside your home, this is not usually the case. Signs of a chipmunk inside are scurrying noises throughout the day. Lots of movement is involved. Since chipmunks are not active at night, noises heard during this time may suggest a different kind of rodent infestation. Many calls for chipmunks end up being rats. For this reason it is a good idea to contact an exterminator immediately. While it is rare to find a chipmunk inside, it happens. This is usually on accident. Perhaps your cat brought you a present. In this instance, they will run out if given the opportunity. Open doors and windows to let it out. In cases where chipmunks built a nest inside, then they need trapped. This is best done on the exterior, since they don’t usually roam around the home. If you are sure they are outside you can seal the hole up, and remove the nest. Infared cameras help determine an empty nest. Keep in mind that even though they go outside during the day, they often take a siesta during the heat of the day. Rodents are common carriers of fleas. Chipmunks nesting in and around the home, consequently result in flea infestations. Your pets pick them up outside and bring them in. Otherwise fleas travel into the home when chipmunks are underneath porches and additions. Keep this in mind when deciding to control your resident chippies. This holds true for any wildlife, especially rodents. You may think that throwing some poison bait around will knock chipmunks out. This is not a good idea. Honestly, rodenticides are not labeled for chipmunks. As a result it is illegal. Heavy populations of chipmunks require integrating habitat modification and trapping. This process takes time, yet is worth it. Half-hearted efforts result in leftover rodents quickly repopulating the area.